Environmental campaigners are calling for oil companies and fishermen to do more to protect a beloved north-east beauty spot. Newburgh Beach, opposite Forvie Natural Reserve – the home to hundreds of seals and birds – has been hit with a “never ending problem” of washed-up litter. 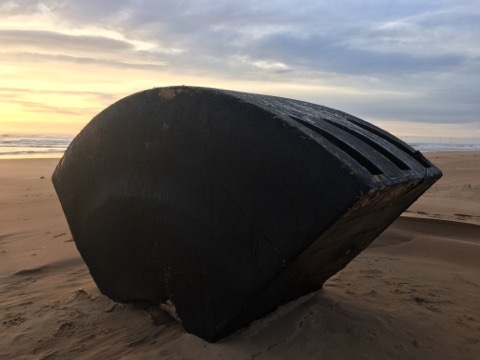 Most recently a quarter of a ship’s fender, heavy with insulated material inside, washed onto the beach – and is too heavy to be removed by hand. Meanwhile, a large, heavy buoy is “completely stuck” in nearby Hackley Bay, despite efforts to dig it out. The owner of the item has been urged to come forward and help with the clean-up operation. Local wildlife volunteer Alex Barelle said: “There is no Planet B. “Newburgh has one of the cleanest beaches on the Aberdeenshire coast but you don’t have to look hard to find discarded plastic. “Polystyrene, wet wipes, bags, nylon rope, hair combs, bits off lawnmowers, you name it and it is here. “It’s a never-ending problem with netting and other domestic rubbish. “The big stuff is a different story, as in some ways is an unintended consequence of the shipping and energy industry that the region depends on. Scottish Natural Heritage, which manages the Forvie estate, has also appealed for help to clear the sands of larger items. Annabel Drysdale, SNH reserve manager at Forvie said: “Our staff remove objects from the coast at Forvie National Nature Reserve whenever we have the ability to do so. “At Hackley Bay a large marker buoy lies almost fully submerged in the beach. “We have been unable to remove this due to its weight and how deep it is buried. 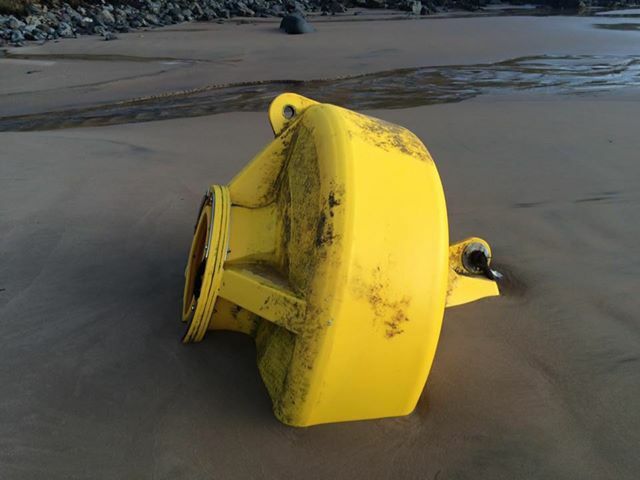 “Staff from Aberdeenshire Council have inspected the site but do not have the means to remove the buoy. In November last year, staff arranged for the removal of a large plastic crate from Hackley Bay. A helicopter which was delivering materials for a path pulled the crate from the sand and took it to the Forvie Centre car park for disposal. 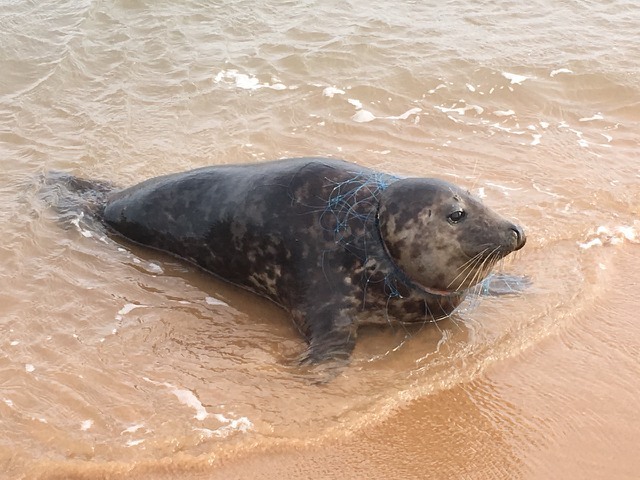 The most recent victim of littering on Newburgh beach was a seal that had become trapped in fishing net. On Monday, three tourists came across the entangled animal washed up on the sand. They called for help and medics from the British Divers Marine Life Rescue (BDMLR) raced to the scene, and also called in the Scottish SPCA to help. A six-person-team restrained the seal to check its injuries, but then saw the wound was worse than feared. The team worked for an hour to carefully remove the embedded net from the seal’s flesh while trying to keep it calm. 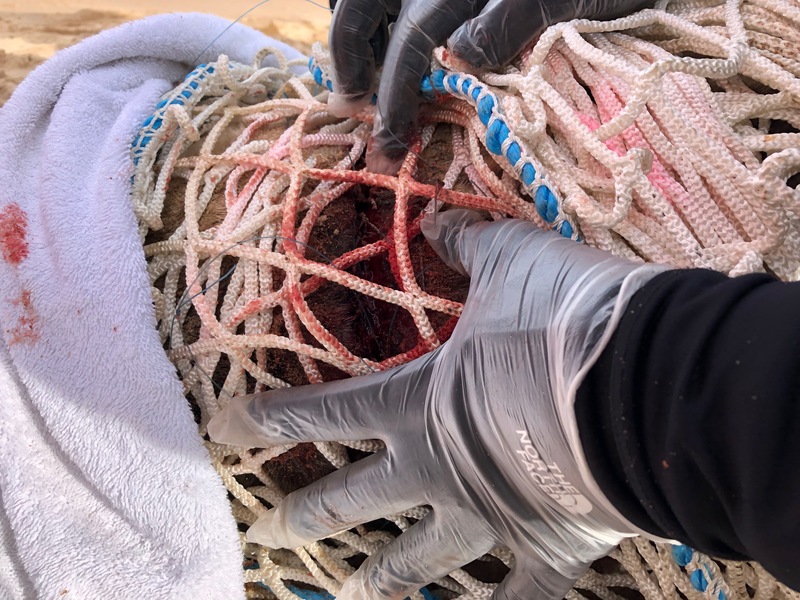 The wound was treated before the seal was safely released, and it swam off. BDLMR volunteer Lee Watson said: “A seal had come out to the tourists and landed at their feet. “It was their first time at Newburgh, but they had fortunately taken pictures when they arrived, and could see our phone numbers when they looked back at their photos. “They stayed for an hour until the rescue team could arrive – when we realised the situation was much worse than we realised. “We were eventually safely able to get the seal back out to water – and we were happy with the decision to let it go, rather than cause it stress by moving it somewhere for further treatment. “There are a lot of entangled seals that wash onto the shore here, a lot more than people think. Scottish SPCA animal rescue officer Kyle McWhirr added: “When I arrived I assisted BDMLR in cleaning the wound and assessed there was no sign of infection. “He was very strong, in good bodily condition otherwise and had a good heart rate so he was released back into the water where he immediately re-joined the rest of the seal haul out on the other bank.